DEBORAH CROMBIE: Okay, enough about Paris. (Well, really, there's no such thing as enough about Paris...) But I want to talk about the places you would NEVER actually go, the thing you would NEVER do, the adventure that weirdly and inexplicable fascinates you. I'm not even a hiker, much less a climber. And I'm not that crazy about mountains, as far as scenery goes. (Give me rolling English countryside, or Scottish moors, or beaches and tropical islands.) I can remember reading about Edmund Hillary's expedition when I was child and trying to imagine what it would have been like to climb the world's highest mountain. But the bug really bit me when I read Jon Krakauer's 1999 account of the 1996 ill-fated Everest expedition, INTO THIN AIR. It is still my favorite non-fiction book. (In 1999, Krakauer received an Academy Award from the American Academy of Arts and Letters, which honors writers of exceptional accomplishment.) Readers, if you haven't read this book, put it on your list! 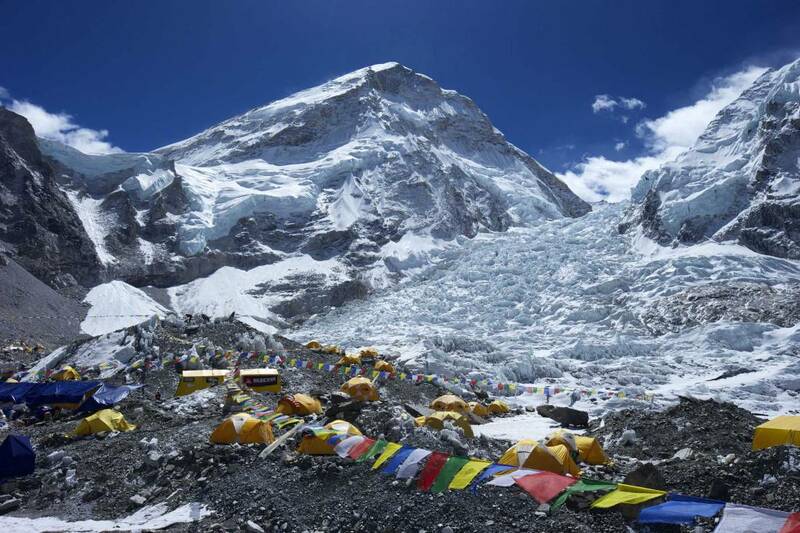 I've since read other books about Everest (Will North's THE GHOSTS OF EVEREST, about Hillary's expedition, is waiting on my bedside table) and seen most of the movies about Everest climbs. I was disappointed with EVEREST (2015) the dramatized account of the 1996 expedition. I think they were trying to be more realistic, but there are a lot of climbers in climbing suits (I couldn't keep up with who was wearing which color) and goggles and face masks, which made them indistinguishable, and the only dialog (mumble mumble) I could understand was at base camp. It's hard to identify with the characters when you can't tell who they are! However, the scenery is spectacular, but I'd read Krakauer's book first. How about you, REDS? What's your ultimate armchair adventure? SUSAN ELIA MACNEAL: Oh my goodness! Miss Edna was obsessed, OBSESSED, with Everest. I watched so many documentaries and read so many books about it with her, it's not even funny. 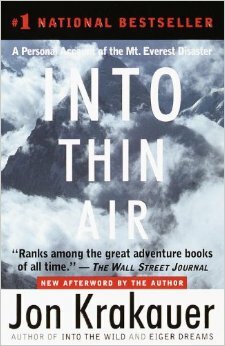 And, Debs, we both loved INTO THIN AIR, too. I was disappointed with the movie, Everest, as well -- I wish they had picked one character and stuck with him or her — it felt a bit all over the place and I also had issues understanding the dialogue. HALLIE EPHRON: I am so sad that it looks as if I won't get to Egypt or Turkey, not with so much unrest in the world. I'll have to travel by book. Like Susan, mountains and jungles will have to be via armchair. A magical place we were at a magical time was Prague just a few months before the Velvet Revolution. It was so beautiful and so alien at the same time. Restaurants where nothing on the menu was actually served; stores where all the merchandise was in locked cabinets; where buying anything (things like bananas from a street vendor, waffles from a window that mysteriously opened onto a sidewalk...) involved waiting in a long line. HANK PHILLIPPI RYAN: I want to live in Oxford, and hang around with Morse. And Lord Wimsey. That would be an adventure, right? But I'd have loved to be on a glamorous first-class high-society cruise across the Atlantic, or the New York night club scene in the 20s or 30s. But--you know. Briefly. Usually when I read about "adventures," I think, whew. SO glad I can read about this and not have to do it. READERS, what fascinates you that you would never in a million years actually do? PS The winner of Mark Pryor's The Paris Librarian is Ann in Rochester! Ann, you do know the drill:-) And congrats! Okay, steep mountains and bug-infested jungles are never going to make my list of places to visit. Unfortunately, the unrest in the world, as Hallie noted, is definitely going to keep me from visiting either Egypt or the Holy Land . . . .
Prague is certainly different today. What an experience. As much as I'd love to visit the pyramids, Amellia Peabody has probably ingested the dust on my behalf. Thank you, from the bottom of my, er, lungs, Ms. Peters, and may you rest in peace. That should have been three fellow students. Ever read Twain's Innocents Abroad? That's my armchair adventure. I would love to see the world at a time when national dress was the norm not a holiday event. Alas, that world is largely gone so I have to be content with armchair traveling in it. Jason Talley is a mortgage loan processor whose idea of adventure travel is a vacation at Daytona Beach. His mundane life is thrown into turmoil when his best friends, brilliant computer programmer Siriam Sundaram and beautiful wife Vidya, are found dead in an apparent murder-suicide. The night before, Siriam gave Jason a gold-embroidered red sari for safekeeping. It was for his mother in India, Siriam explained, and soon he was going to carry it to her. Stunned and grief-stricken by his friends’ deaths, Jason signs up for a tour of India. He intends to hand-deliver the sari to Siriam’s mother. The first day out, Jason is hijacked by Rachel Moore, an auburn-haired Canadian beauty. “Forget the tourist crap, give me trains,” she says. Before he can say “Excuse me?” she trades their tour-bus seats for train tickets and drags Jason out into the real world. Soon the landscape peppered with villains and Jason’s pilgrimage to deliver the sari is fraught with peril. Benoit perfectly captures the claustrophobia of being held captive on a packaged tour with fellow tourists who are content to see some fabled destination from the hermetically sealed windows of a bus. He takes the reader on a journey from mind-numbing poverty to breathtaking opulence, from Delhi to Bangalore with a detour through Bollywood. The India here is richly detailed and exotically scented—a thrilling trip for the vicarious traveler. I also love reading about the past, but I don't want to live in it. Give me a flush toilet and modern medicine any day. I have to say I don't think I have much of a travel bug. I'm quite happy staying at home (I define "home" as the USA). I don't know that I'd ever visit South America or Africa (bugs - a friend of my and her daughter went on African safari and the daughter came back with a bug bite by something unknown that turned black! ), the Middle East (unrest), or the Far East (can I really sit in a plane that long?). Australia's Great Barrier Reef is gorgeous but from what I've read almost everything on that island continent can kill you! No, I'll just stay at home and read, thanks. Keep those books with lovely settings coming! Hank, you can get a little taste of the opulence of former times still today, on the Orient Express from Cusco, Peru to Aguas Calientes, at the base of the mountain leading to Machu Picchu. When I was there they had just only partially reopened from the landslide that took out a portion of the tracks, but I understand it's fantastic now that it's back to full service. Look up Orient Express Peru, lots of good sites. Kait, Innocents Abroad is my all-time favorite book. I try to reread it every ten years. Speaking of sanitary facilities, I tend to notice the lack a reference to that in stories. I kept wondering in Swiss Family Robinson what they used for a bathroom. They went into so much detail about all the marvelous things they created for their "house", but no mention of a loo. I know--I was a strange child. Thank you, Hallie, I have always wanted to go to India, been many times in books so am thrilled to know about another. the other place I wanted to visit was Manchu Pichu and we had tickets and everything but my in-laws got ill so we stayed with them instead which I will never regret. Hallie, I'm looking up that book. Also, there's an episode on Anthony Bourdain's No Reservations where he crosses India by train. I think it's in Season 1, but I'll look it up. Fabulous! Machu Pichu! It's a doable trip for anyone reasonably healthy (as long as you don't intend to walk there via the Inca Trail). And it's near the beautiful Sacred Valley (near Urubamba, one of my all time favorite place names) and the lovely city of Cusco. We went with a tour that was excellent, taking time at lower altitudes to build up your ability to function at 8,000 feet. Antarctica! Fascinated by the Scott, Amundsen, and Shackleton expeditions, but I never want to be that cold. I also loved Into Thin Air and skipped Everest because I heard it wasn't good. I was incredibly fortunate to go to Egypt before things got so bad. That trip was legendary. We were on a tour in March of 1979 and were in Egypt first. We had a great time there, but things started to happen the day we were to leave for Jordan and then Israel. On our way to the airport, huge crowds lined the highway. There were, all overnight, billboards showing Anwar Sadat and Jimmy Carter. We had a long wait at the airport, then watched Air Force One land. After a three hour wait, we took off on our way to Jordan. We had an uneventful time there and headed on to Israel where first went up north to the Galilee and Haifa areas. After a few days, we headed down toward Jerusalem, but kept being stopped at roadblocks for our bus to be searched. Then we learned that Jimmy Carter was about to land in Jerusalem. A few weeks later, Carter, Sadat and Begin met at Camp David. That's a trip I will never forget! Like you, Susan, I have read and re-read the Amelia Peabody books. They are terrific. I cried the day I heard Barbara Mertz had died. So sad. I missed this! And I know just what adventure I love to experience from the chair beside the fireplace - sailing around the world. Or throughout the South Pacific. I love accounts of epic sailing voyages, and I love sailing...in Casco Bay. Ross and I have even kicked around the idea of getting a boat instead of a retirement home and sailing up and down the Eastern seaboard. In sight of land. Where we can berth every night and wash our clothes at a laundromat if we want. See, sailing is wonderful, but cooking every meal in a galley is a pain, and your clothing eventually all gets either salt-stiffened or slightly damp, and someone has to keep watch all the time. Not to mention the scarcity of showers and inability to get away from each other. So I'll keep on reading about adventurers retracing old voyages, or families who up stakes and move on board - who doesn't love pictures of glorious seascapes? - but in my own life, I'm staying closer to the shore. And I really really want to try zip lining and go up in a balloon. Hmmm. Anyone else? No on the balloon, Ann:-) Although my kids did it this summer. Julia, I'll have to tell you about my brother and sister-in-law. The live on their boat (now in Tasmania) and have done the Pacific Crossing twice. Or is it three times now. Hmmm. Wonder if I could get them to do the blog??? I would also pick Antarctica as my first armchair travel destination. There are a couple of countries that are difficult for a solo female/foreign visitor to go alone. For example, I have read that women traveling alone are not allowed to enter Saudi Arabia unless they will be met at the airport by a husband, a sponsor or male relative, so this might be another location best visited virtually in a book! North Korea would be another country with a lot of travel restrictions. I've never wanted to do anything too extreme, but traveling on the Orient Express would have been lovely. I saw a picture the other day of one of the old Orient Express trains, showing its interior as well as its exterior. It was quickly succumbing to the elements. Such a shame. Deborah, if you like reading about Everest, do try books by the mountaineer and writer Joe Simpson. His book Touching the Void (which was also made into an excellent movie) is a classic tale of adventure in the mountains (in the Andes in this case), with some really terrifying moments. I also really enjoyed _This Game of Ghosts_ (a biography), _Dark Shadows Falling_ (about the ethics & psychology of mountaineering wnd discussing the 1996 Everest expeditions), and _The Beckoning Silence_ (fear and climbing). Alayne, thanks so much! Looking these up asap! Oh Kathy Reel - the Orient Express! Okay, that's one I'd have done in a heart beat!